Kili, Truman, and Rachel have been settling in the bird room together well. I have been getting back into flying them for exercise. For now, I'm just having them fly in the bird room. All three parrots are at ease with each other and know their own perches well. They all already know their names and only fly when called. But now they are mixing it all together. 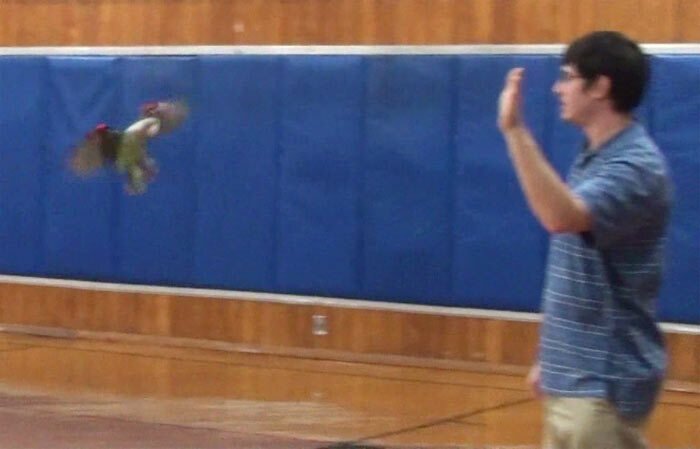 Flying three parrots for exercise can be quite intense. I alternate my attention between the birds. Each bird flies to receive food. While two parrots are busy chewing their reward, the third already finished and is ready to fly. This leaves at least one parrot ready to go at any time. This routine not only keeps things moving for me - it sure does take a while to get three birds to fly enough to go through an entire meal - but it also gets a rivalry going between the birds that keeps everyone trying. If one of the birds gets lazy and doesn't come, I will simply move on to the next. The next bird is happy to have a sooner opportunity to come. Meanwhile the bird that didn't come gets punished by missing a turn and having to wait for the next chance to come around. This has been extremely effective and virtually eliminated disobedience. In the past, flight training just one bird at a time, I would encounter a lot of frustration when the bird wouldn't come. I have limited time to spend on training, so when the bird isn't coming, the session will either take longer or the bird won't be exercised as much. Whenever the bird would stop cooperating to look around or worse yet just sit there for no reason, I would be powerless at that moment to keep things moving. But now with three birds training together, there is always a bird or two that will pick up the slack for the others. This keeps me from just standing around waiting for birds to resume cooperation. But not only that, it makes the lazy bird(s) realize that others are getting their treats! This fixes things in a hurry. When the birds finish chowing down their food reward, they are attentively waiting for the next opportunity to be called. I occasionally mix up the order of the recalls to keep them on their toes. On the rare occasion that the wrong bird comes, it receives no food and is just sent back to the perch. They realize quickly that it is a 100% chance they won't receive a reward if they come when I call another, so they learn to stay put unless called. This is important when there is a bunch of birds so that they don't interfere with each other. Starting out, Rachel was definitely the weak link. While Kili and Truman would come reliably from years of experience, Rachel would often not come or take too much time. Since the added competition of the other birds, Rachel's success has more than tripled! She is almost as good as the others. She has made years of solo improvement in a month with the added competition. I think the improvement was so huge because Rachel got both a dose of example as well as rivalry! She got to see how well the other birds do and how much they get rewarded. She realized that this is the way to be if you're a bird! Another interesting improvement came in Truman. Truman has always been second rate to Kili in everything. If Truman flew 50 recalls, then Kili flew 100. When Truman improved to being capable of 100, Kili was at 150! Because he could never accomplish being better than her at anything (at least training wise), I don't think he ever really tried. But when Truman realized he could be better than Rachel, he was all over it! Truman became much more attentive and quick to respond. On the other hand, Rachel is now close on his tail with her improvement so I hope to keep this competition going. There's no doubt that Kili is simply the best. Her mantra is anything you other birds can do, I can do better. Even when she's training solo, she'll work as hard as the other birds would in a competitive environment. But when the other birds are trying too, Kili can keep flying reliably even after she is completely full or not even hungry at all in the first place. I'm pretty sure that I could get her to fly as much as the other birds without any treats at all. She is just so competitive and has to be best! Oftentimes toward the end of the flying session I am trying to compensate the bigger birds with extra food. Kili is already too full and clearly done eating. Truman and Rachel might have missed a few treats when they were being obstinate. Kili got every single one. So just to get the others to fly as much as Kili, I need to park Kili and give them a chance to catch up. Well, Kili keeps begging to come so I call her but don't give treats. I know she is full and can't/shouldn't have more. As long as the other birds keep coming, she does too, even when she is obviously getting nothing. But she plays a good model and it helps me keep the others going till they finish. It is important to note that getting or training more birds is not necessarily going to improve things for other people. If you have a bird that is uncooperative or bad at training, I would first focus on your training techniques and the birds motivation. Only when that bird without doubt knows what it is doing, does it right most of the time, and does an overall pretty good job is it ok to think about training along another bird. Competitive training isn't a solution to poor training/motivation. Instead it is a superlative booster for already effective training. 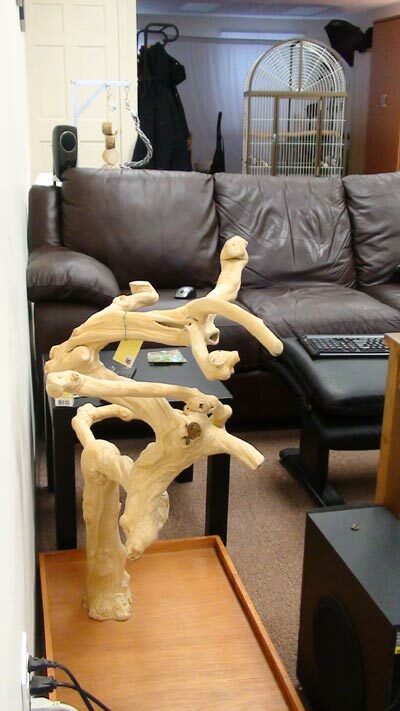 A very common question parrot owners ask is how much time should my parrot spend out of the cage? Or they ask what are the minimum number of hours my ________ (fill in the species) needs to spend outside of the cage every day? The problem with this question is that it asks for a quantitative answer to a qualitative question. Here's my answer. 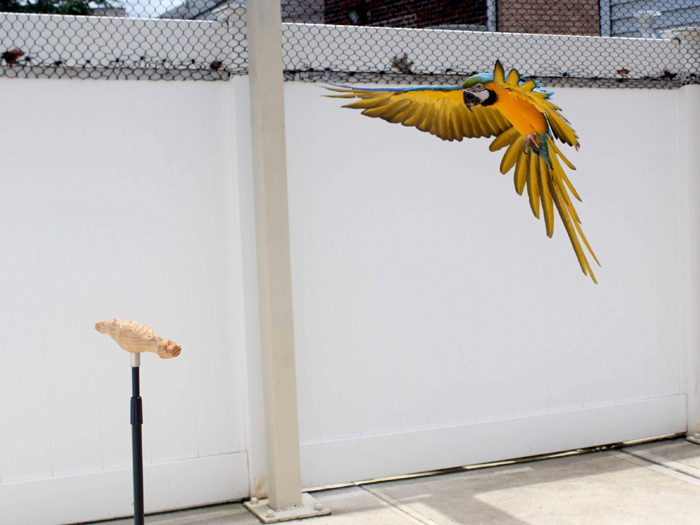 It doesn't matter how long your parrot spends outside of the cage every day! What matters is how it spends its time out of the cage! Too many parrots get their wings clipped and placed on a tree for hours at a time. The tree thus serves as nothing more than another cage! The bird cannot leave the tree and do what it truly wants (at least within the confines of the house). I'm not saying it's bad to put your bird into different �cages� throughout the day for variety but if the bird isn't free, this isn't �out of cage� time. In the case of social companion parrots, the parrot wants to spend time with you do and do what you do. Putting the parrot down on a stand while you check email is no less boring to the bird than sitting in the cage. Out of cage time needs to serve as interactive time between you and your parrot for it to really count. The parrot needs to be part of what you are doing and you must be part of what your parrot is doing. No quantity of hours sitting out can replace this. Parrots want to be in the middle of everything, the center of attention, and do what you do. They cannot be content being a passive part of your life. Is the tree not just another cage if the parrot isn't free to go elsewhere by flight? You wouldn't realize how much your parrot likes or doesn't like its tree unless you can observe it choosing to go there or choosing to leave. Despite how awesome I thought this tree is, it took Truman less time to get bored of it than it took me to build it! The other issue is that some parrots don't really want to be out. In that case, forcing out of cage time only harms your relationship. Grabbing a parrot out of the cage with a towel to make it serve it's mandated �out of cage time� only makes the relationship even worse. It will only cause stress and distrust. The parrot will not enjoy that time and even though it received out of cage time, it entirely missed the purpose of that time. To achieve a great relationship, the parrot should want to come out and to spend time with you. 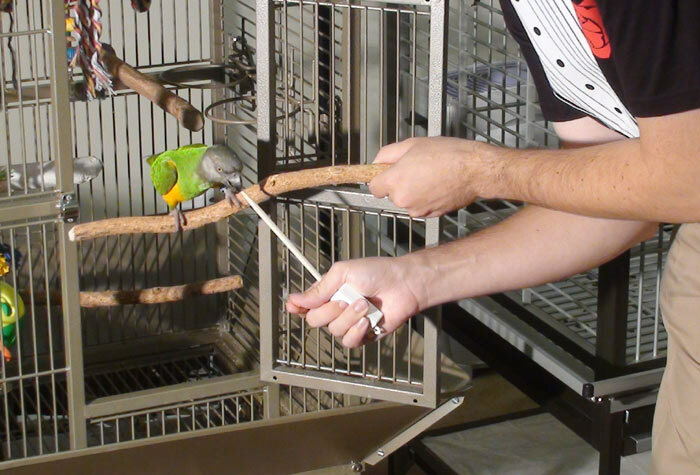 When you use some of the out of cage time to serve positive interactive purposes such as trick training, it sets real goals for your parrot and reasons to want to be out. If the parrot isn't enjoying being out, out of cage time is actually doing more harm than good! Actually, I don't think there is a minimum amount of out of cage time. Rather there is a minimum amount of daily interaction, minimum amount of positive reinforcement, minimum amount of flying exercise, and minimum amount of a love that a parrot must have. These minimums aren't known so it is best to give as much as possible that your parrot wants to ensure you are not below minimum (as we all know parrots that don't get enough of these may resort to behavioral problems such as plucking). In terms of good behavior, less is more. It is actually easier to set a maximum value for out of cage time for parrots than minimums. Although the parrot may wish to be out to interact and play as much as possible, if we let the parrot stay out too long, inevitably undesirable behavior will ensue. Almost no companion parrot can spend all day out of the cage without resorting to doing things that annoy us. Whether it's chewing up furniture, screaming, flying to us endlessly, nipping/biting people, or getting in fights with the rest of the flock, these are all the results of boredom from being out too long. 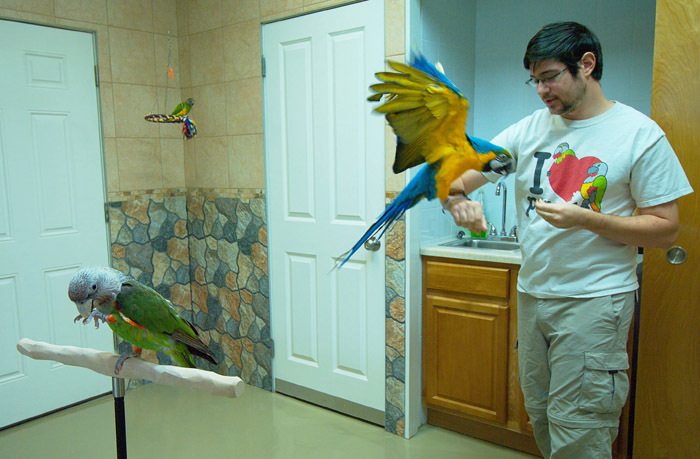 To make the most of your parrot's out of cage time, perform parrot training and keep interactions direct and focused. However, put the parrot back in the cage before it has the opportunity to turn to nuisance behavior. If the parrot becomes accustomed to spending too much time out of the cage, it will be less inclined to be well-behaved and more likely turn to nuisance behavior to seek attention or entertain itself. You must use preemptive measures to keep the parrot trained or occupied. However, eventually these run out. The parrot is no longer hungry for training rewards, the parrot has had its fill of attention, etc. This is when the parrot turns to nipping the owner for fun or attention, chewing the curtains, attacking others, etc. Worse yet, whatever you end up doing in response to such undesired behavior (hurt parrot, put parrot away, yell at parrot, say 'no', etc), will only make things worse. The bad behavior is already learned and the parrot becomes reinforced to seek your attention with it. Thus the parrot must be put away into the cage while things are still good. Leave some desire for next time to enjoy being out. Keeping out of cage time short but well-behaved is far better than long and chaotic (the parrot will hurt itself or the owner will burn out before you know it). As the parrot develops good habits during short but guided out of cage sessions, it will become more accustomed to behave that way whenever out. You can progressively have the parrot out for longer durations but the habitual good behavior will persist for longer spans of out of cage time! 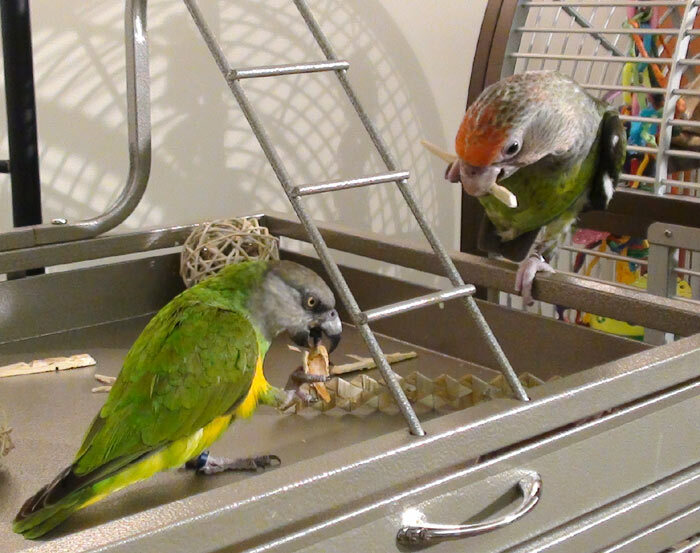 For new parrot owners or owners with problematic parrots, doing short target training sessions for spans of 5-10 minutes and then putting the parrot away for a meal in the cage is a great way to start building up good behavior. You can progressively expand durations of time and introduce more play/interaction with time. Before you know it the parrot can be spending hours out where the parrot behaves in an acceptable manner to people and the parrot gets to enjoy the things it wants while out. One of the top benefits of out of cage time to a bird is the space to fly. The cage almost never provides room to fly and even most outdoor aviaries are inadequate. However, in the space of your living room, the parrot has the space to stretch its wings and exercise. The parrot does not need to be flying all day long to get exercise but to make up for all the time on its legs in the cage, getting to fly while out is essential. The other type of out of cage time we must seek to offer is out of [house] cage time. Taking your parrot outdoors is very enriching. The sights, sounds, smells, etc are all something different for the parrot to take in. Also the bird requires outdoor time for its health (vitamin D and calcium production). Use a harness to take your parrot outdoors as much as possible. Inevitably this turns into focused together time and is a top way to provide valuable out of cage time. It is good to have a fair amount of predictable routine for your parrot when it comes to the out of cage time schedule. Give your parrot something to look forward to every day. But once in a while, break it up. Some days take your parrot out for longer, take your parrot some place outdoors, or leave it in its cage entirely. This helps the parrot adjust to a more varied lifestyle and prepare it for any changes. The parrot should enjoy out of cage time but it shouldn't be helpless without it. So rather than imposing silly minimums like "A budgie should get at least 30 minutes a day of out of cage time, a conure should spend an hour outside of the cage, an African grey should get at least 3 hours of out of cage time, and a cockatoo needs to spend all day with you," you should put far more focus on the quality of time the parrot spends outside the cage instead. This is the out of cage time that truly matters. 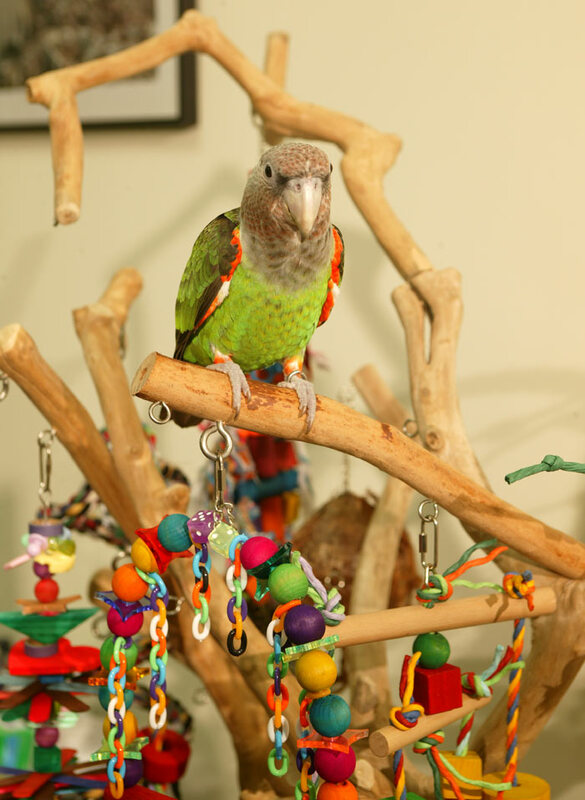 That said, try to provide as much out of cage time as you are able but instead of stressing about the exact amount, focus on making it more interactive, exercising, and stimulating for your parrot. The out of cage time should be both enjoyable to the parrot but also to the owner. There must be balance such that both owner and parrot are happy for this long term arrangement to last. Keep early out of cage times short and sweet but stretch your parrot's endurance. Practice having the parrot out longer and longer but be sure to put the bird away before things can get bad. Having a well-behaved parrot that enjoys its out of cage time is a win/win for everybody. Kili & Truman went back to school today to experience their biggest, freest flights to date. Two years since they began their flight training in the larger spaces at my old high school, they returned to fly in the enormous gymnasium. Pending some of Truman's - ehem - reliability problems during the earlier sessions, I did not want to take the chance of him landing and refusing to fly down from the unreachable rafters in the gym. Flying birds in this gym is the real deal. In the little gym we first used and then later the theater, it was possible to at least reach the birds with a long recovery perch. But in this gym there were many places that would be impossible to reach. I was putting my faith entirely in the birds' wings. Having done two years of extensive flight training with Truman, I was ready to take this chance to further his flightducation. Just to be sure he'd come down to me if he did end up in an unreachable place, I brought his weight down to his training minimum weight. Kili on the other hand, I took down no further than typical training weight because I was comfortable and certain that she would do just fine. I've already taken chances flying her in irrecoverable indoor locations (such as TV studios) and knew what to expect from her. What I mean by an irrecoverable indoor flying location is basically a location where the bird could land in such places that it would be impossible for the owner to recover the bird (except by the bird returning on its own). This is the closest thing to outdoor freeflight but without the risk of permanent loss or predation. Note, I do not encourage anyone to attempt to fly their parrot (or for that matter have it unrestrained) in an irrecoverable indoor flying location without extensive flight training experience. Although it may not result in the death or escape of your parrot, it may cause extensive problems for the bird and disruptions to the facility. Instead, I encourage you to find recoverable large indoor flying locations first. 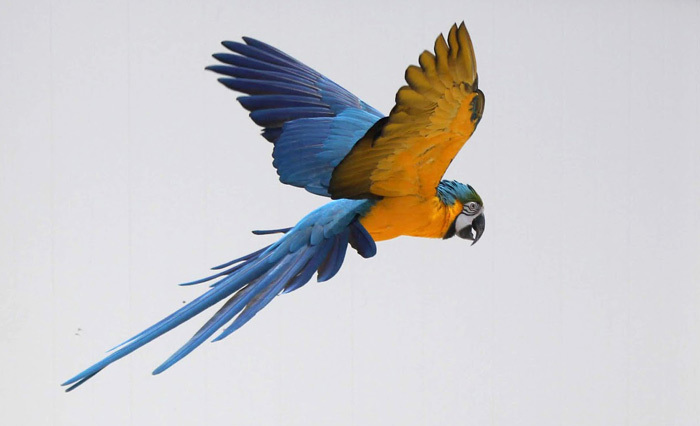 This is not only to practice but also to test how your parrot would behave flying in a novel location. You don't want to be finding out that your parrot will fly right up to a 60ft ceiling, land, and be incapable or unwilling to come down the first time you are trying this! For the recoverable locations, I have designed a parrot recovery perch for getting parrots down from places up to 20ft high. If you are interested in one, please contact me directly. Only after you are confident that while flying in recoverable locations, your parrot has reliably returned to you even after landing in high places, then can you attempt flying the bird in a place with unreachable ceilings. I started out with Kili & Truman on their training perches in the center of the gym. I had them fly short recalls to get the hang of flying in this new place and then progressively increased the distance until I was able to have them fly across hundreds of feet to reach me. I had them fly short boomerang flights to remind them how to return to me which proved useful when they would overshoot me. You see, parrots that are used to flying in confined spaces may develop too much speed flying in the open to slow down in time to land on you. Boomerang flying is a great skill to develop so that they would have the practice to turn around instead of just flying away. It definitely helps to have two birds instead of one. One motivates the other. When Truman would recall first, Kili would eagerly follow when called. And vice versa. If one bird were to land and not come down from somewhere, giving a lot of attention, recalls, and treats to the other bird can sometimes drive it out and back to you. 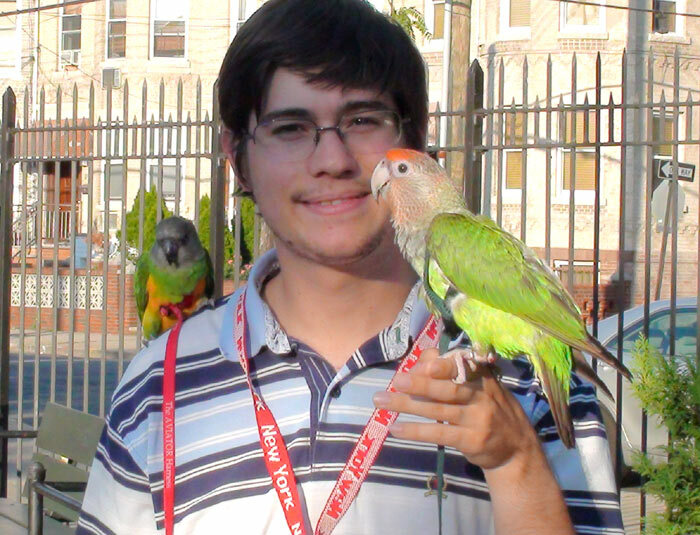 So while on one hand flying two parrots is more work and more to keep track of, it also helps improve the motivation of both birds at the same time! Finally, when I was comfortable that Kili & Truman had no trouble finding me to land on, I sent them off to freefly around the gym to their hearts' content. I was curious if they would end up flock flying together or independently and it appeared to be more of the latter but really they were just all over the place. Kili enjoyed flying extensive figure eights around the gym at high speed and I was surprised to find that her stamina was better than Truman's! Don't forget that Kili is permanently missing some flight feathers, was not fledged as a baby, and has always been the weaker flyer. This made me realize that I had always worked her harder to compensate for this and as a result she ended up outflying Truman who is the natural born flyer! In the span of over an hour the birds flew over a mile of heart pumping exercise flights both on command and of their will. They stayed on their perches until called and flew around when I offered them to. Overall I was very pleased with the session and my brother helped me record some of the highlights to share with you. This is the 2nd video with footage of the birds' 3rd gym flight training session which also features Kili's newest trick. 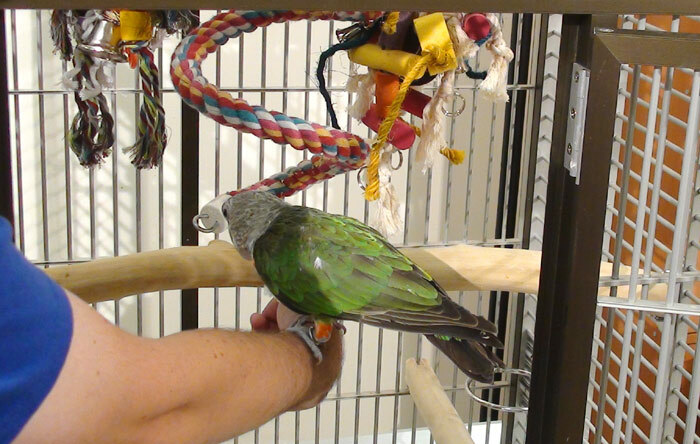 Truman, my Cape Parrot, learned the flighted retrieve in no time. Being a bird of the air that he is, he made the transition from running around (if you can call it that) to get the ball to flying for it without any special thought. You see, unlike Kili, Truman has never been clipped in his life and is completely at ease in the air as any bird should be. Normally I develop videos and training guides for new tricks that Truman learns but this time there was really nothing to show. One time I rolled the ball on the floor and Truman walked back to me with it, the next time I kneeled with my arm higher so he flew up to it still holding the ball when I called his name. That and a few sessions of practice was all it took before Truman would fly all the way across the room to any place on the floor to fetch the ball and bring it to me. I even took the trick a step further and taught him to land on my hand and then walk over to my shoulder with the ball before giving it to me. This too was extremely simple to teach. First I had him give me the ball on my hand, then I started having him walk more up my arm to give it to my other outstretched hand. Eventually I stopped signaling him to walk to my shoulder and he just continued doing it out of habit from the previous trials. 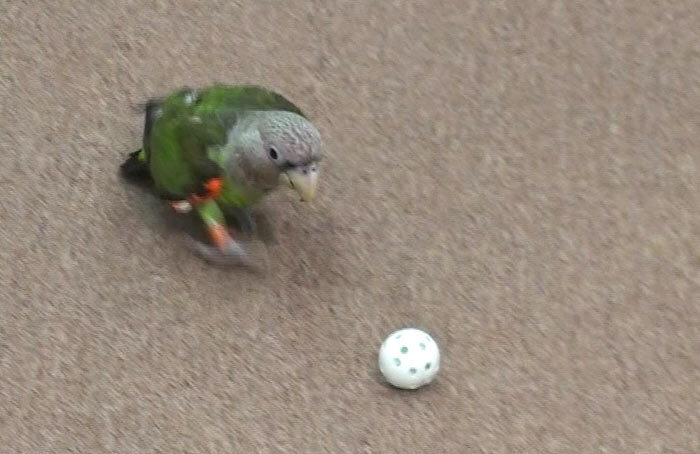 So instead of going into further detail about how easy it was to teach Flighted Fetch to Truman, I will tell you how I taught it to my Senegal Parrot Kili which is more likely what others would need to go through to teach the trick to their parrot. Kili already knew how to fly and how to fetch, so it was a matter of making the connection in her little bird brain to do them simultaneously. So for obvious reasons, your bird needs to already be a veteran at fetch (and be able to do it on different surfaces with different objects with ease) and be capable of flight. 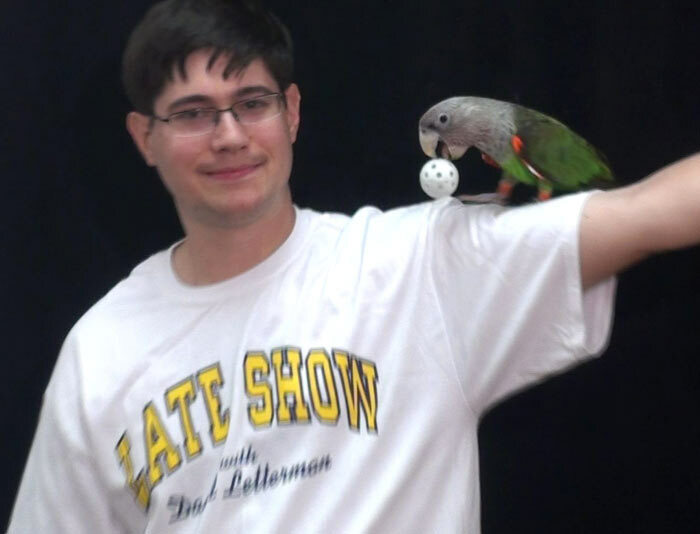 Ideally the bird should be flight recall trained but it is technically possible to teach a parrot that doesn't normally fly to you to do fetch on its own anyhow. I found a pair of flat/simple chairs best for this but you could just as well use two coffee tables or other surfaces of similar shape/size that can be placed up against each other at first. Start by having the parrot walk around on one surface fetching the object at one end and bringing it to a cup or your hand at the other end. Use the objects and retrieve methods already most familiar to the bird. 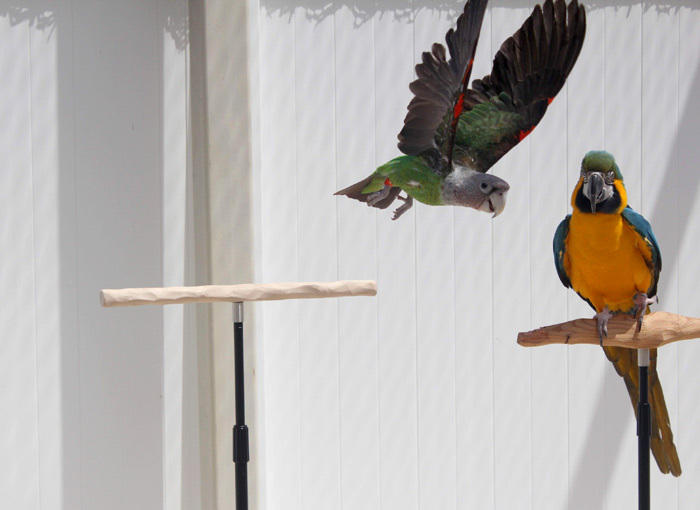 Once the parrot is comfortable fetching on this surface, begin having it fetch back and forth between the two joined chairs or surfaces by walking across the gap. As the parrot becomes better at fetching across the divide, slowly begin to spread the distance between the chairs with each subsequent retrieve. At first the parrot will walk across the short gap, but as the gap widens it will have to hop and eventually flap to make it across the divide. 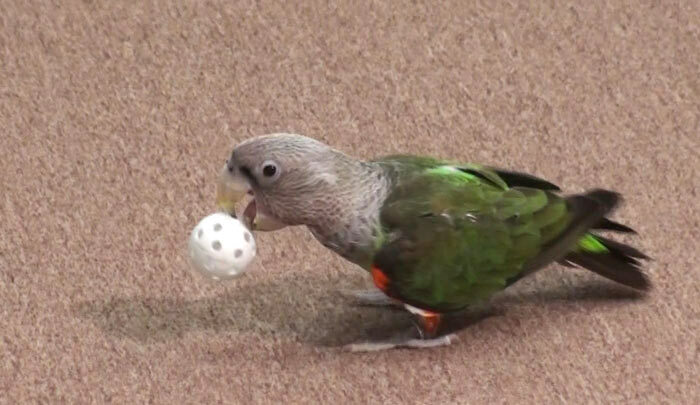 By the time your parrot is flying from chair to chair to deposit the ball, you'll be able to place them quite far apart and the parrot out of habit will continue to fly between them to fetch the ball. All that is left now is to teach the parrot to use flight in other ways such as down to the floor and up to your hand with the object. At least the basic skill and concept of flying with an object has been achieved. You can go back to the twin chair method but substitute the second chair for your hand. Place your hand within step up distance of the only chair you are now using. Ask the parrot to fetch but instead of flying to the other table, get it to step up on one hand and then deposit the object into your other. Just like the prior process of spreading tables, move your hand further and further away. 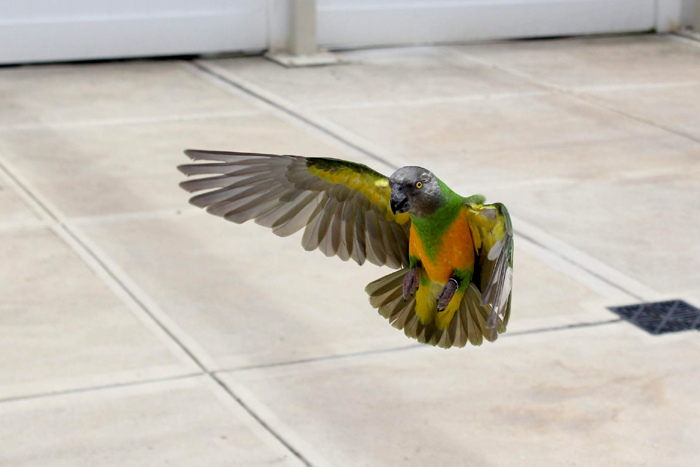 You may or may not need to use your parrots flight recall cue to motivate or hint it to fly to your hand once it has retrieved the object. Some things to keep in mind for teaching this trick. First of all, this is a fairly advanced trick. 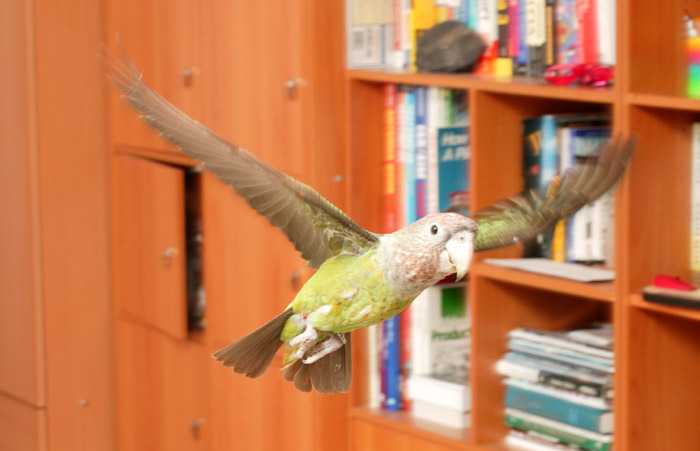 Don't expect your parrot to learn this fresh out of learning retrieve or its first few tricks. I waited two years since Truman learned to fetch before I decided to add the flighted element to it. I wanted a long term rock solid history of retrieve beforehand. The most common difficulty will be the parrot dropping the object when it tries to fly to you or forgetting to bring it and flying to you. The best solution is to use my spreading method because then the gap grows so gradually that the parrot transitions from walking retrieve to flighted retrieve without realizing the mobility change. If you try to go straight from normal retrieve to flying up from the floor with it, the parrot is likely to be confused. If you encounter any trouble at any stage, just go back to the last success point and keep practicing. Make even slower progress before increasing the gap. Remember to practice and perfect short distance flighted retrieves before moving onto longer ones. Once the parrot grasps the concept, be sure to challenge it and you will be surprised at how extremely capable they really are! You can even take this a step further and incorporate flight into all tricks that are derivatives of the retrieve. For more fun and greater exercise, I have Kili fly recalls across the room for the opportunity to perform a trick. Then I create a divide that mandates flight. So instead of laying out coins on a table for her to put in her piggy bank, I throw the coins on the floor and then Kili flies up and down with them. Likewise with ring toss, I toss the rings on the floor so not only is Kili challenged by the colors puzzle but also to physically go and get them.